Fractional values such as 3/4 can be used. where x is an unknown, a is referred to as the quadratic coefficient, b the linear coefficient, and c the constant. The numerals a, b, and c are coefficients of the equation, and they represent known numbers. For example, a cannot be 0, or the equation would be linear rather than quadratic. A quadratic equation can be solved in multiple ways including: Factoring, using the quadratic formula, completing the square, or graphing. Only the use of the quadratic formula, as well as the basics of completing the square will be discussed here (since the derivation of the formula involves completing the square). 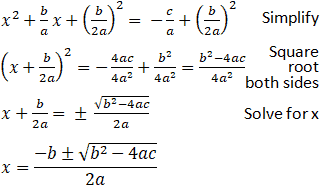 Below is the quadratic formula, as well as its derivation. Recall that the ± exists as a function of computing a square root, making both positive and negative roots solutions of the quadratic equation. The x values found through the quadratic formula are roots of the quadratic equation that represent the x values where any parabola crosses the x-axis. 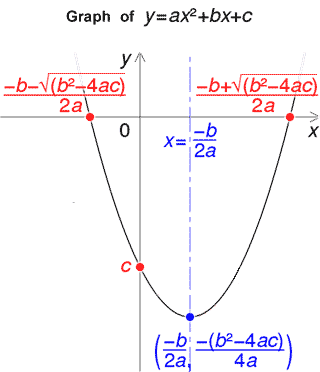 Furthermore, the quadratic formula also provides the axis of symmetry of the parabola. This is demonstrated by the graph provided below. Note that the quadratic formula actually has many real-world applications, such as calculating areas, projectile trajectories, and speed, among others.